On Sunday night, mere hours before the fourth Democratic debate, Sanders tried to head off Clinton’s attacks by releasing his plan. Only what he released isn’t a plan. It is, to be generous, a gesture towards a future plan. To be less generous — but perhaps more accurate — this is a document that lets Sanders say he has a plan, but doesn’t answer the most important questions about how his plan would work, or what it would mean for most Americans. Sanders is detailed and specific in response to the three main attacks Clinton has launched, but is vague or unrealistic on virtually every other issue. The result is that he answers Clinton’s criticisms while raising much more profound questions about his own ideas. Sanders promises his health-care system will cover pretty much everything while costing the average American almost nothing, and he relies mainly on vague “administrative” savings and massive taxes on the rich to make up the difference. It’s everything critics fear a single-payer plan would be, and it lacks the kind of engagement with the problems of single-payer health systems necessary to win over skeptics. Clinton’s first attack was that Sanders hadn’t released a plan. Now he has. Clinton’s second attack was that Sanders would rely on states to manage and partially finance his health-care system, as he’s proposed in the past. His plan puts that criticism completely to rest, clarifying that the system will be “federally administered.” As far as this document goes, there is no role for states at all. 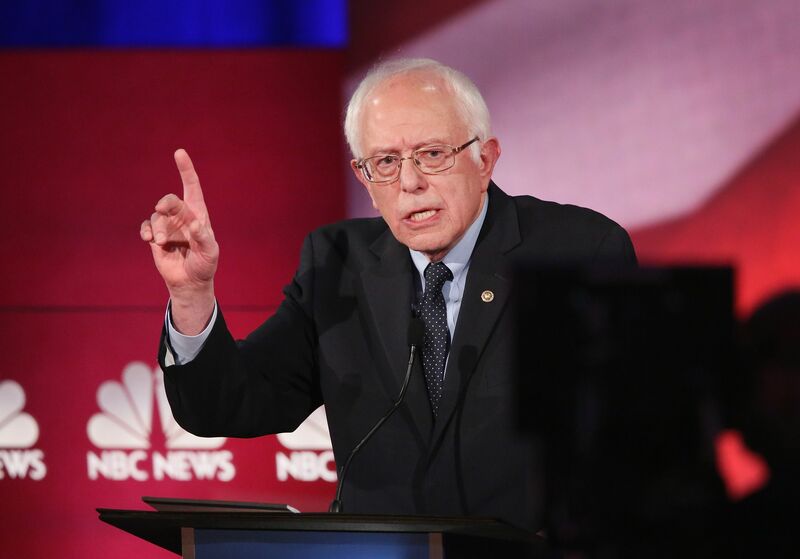 Clinton’s third attack was that Sanders’s plan would raise taxes on the middle class. In response, Sanders gets very detailed on the financing of his plan. It would raise taxes on the middle class — in part through a 2.2 percent tax increase on all income, and in part by a 6.2 percent “income-based premium” on employers (which would, in turn, get passed onto workers through lower wages and higher prices). The rest of the financing would come through a raft of new taxes on the rich. Sanders would raise marginal rates on income over $250,000, he would raise the tax rate on capital gains and dividend income, he would hike the estate tax, and he would close sundry deductions and loopholes. In general, I’m comfortable with higher taxes on the rich — though they’ve risen substantially in the Obama era already — but tax increases of the scale Sanders proposes here would begin to have real economic drawbacks. European countries tend to pay for their health-care systems through more broad-based, economically efficient taxes like VATs; Sanders’s effort to fund a universal health-care system so heavily on the backs of the wealthy would be unprecedented. All in all, Sanders wants to raise taxes by a bit over a trillion dollars per year — which may not sound like much to those who remember the Obamacare debate, but remember that the numbers that got thrown around for Obamacare were 10-year estimates. Adding inflation, Sanders will be raising taxes by close to $15 trillion when the Congressional Budget Office applies its normal scoring window. Of course, these new taxes replace the premiums Americans pay now. Here, Sanders promises that between shifting health-care financing to the rich and cutting costs through single-payer’s efficiencies, his plan will only cost the average American family around $450 — a savings of more than $5,800 over what they’re paying in premiums now. Those benefits are big. To get them, Sanders is assuming some immense cost savings. And that’s where the problems start. Sanders calls his plan Medicare-for-All. But it actually has nothing to do with Medicare. He’s not simply expanding Medicare coverage to the broader population — he makes that clear when he says his plan means “no more copays, no more deductibles”; Medicare includes copays and deductibles. The list of what Sanders’s plan would cover far exceeds what Medicare offers, suggesting, more or less, that pretty much everything will be covered, under all circumstances. Bernie’s plan will cover the entire continuum of health care, from inpatient to outpatient care; preventive to emergency care; primary care to specialty care, including long-term and palliative care; vision, hearing and oral health care; mental health and substance abuse services; as well as prescription medications, medical equipment, supplies, diagnostics and treatments. Patients will be able to choose a health care provider without worrying about whether that provider is in-network and will be able to get the care they need without having to read any fine print or trying to figure out how they can afford the out-of-pocket costs. To be generous, it’s possible that Sanders is just being cynical in his wording, and what he means is that, under his plan, individuals have to fight with the government rather than private insurers when their claims are denied. But the implication to most people, I think, is that claim denials will be a thing of the past — a statement that belies the fights patients have every day with public insurers like Medicare and Medicaid, to say nothing of the fights that go on in the Canadian, German, or British health-care systems. What makes that so irresponsible is that it stands in flagrant contradiction to the way single-payer plans actually work — and the way Sanders’s plan will have to work if its numbers are going to add up. Behind Sanders’s calculations, both for how much his plan will cost and how much Americans will benefit, lurk extremely optimistic promises about how much money single-payer will save. And those promises can only come true if the government starts saying no quite a lot — in ways that will make people very, very angry. Sanders answered Clinton’s criticisms, but he didn’t answer the most important questions about his plan. But to get those savings, the government needs to be willing to say no when doctors, hospitals, drug companies, and device companies refuse to meet their prices, and that means the government needs to be willing to say no to people who want those treatments. If the government can’t do that — if Sanders is going to stick to the spirit of “no more fighting with insurance companies when they fail to pay for charges” — then it won’t be able to control costs. The issue of how often the government says no leads to all sorts of other key questions — questions Sanders is silent on. For instance, who decides when the government says no? Will there be a cost-effectiveness council, like Britain’s National Institute for Health and Care Excellence? Or will the government basically have to cover every treatment that can be proven beneficial, as is true for Medicare now? What will the appeals process be like? This might sound technical, but it’s absolutely critical. Sanders implies everything will be covered because he knows how important that question is to people. But everything won’t be covered. So who decides, how do they decide, what gets covered, and what doesn’t? Without knowing that, it’s impossible to say whether a particular single-payer system is a good idea or a really, really bad one. Another crucial question is whether Sanders envisions the possibility of exit inside his system. Technically, a single-payer system is a system with, well, a single payer. Private insurers are outlawed — otherwise, it would be a multi-payer system. But the term is often used more loosely than that, and many systems that get mentioned during discussions of single-payer, like the French system, include various kinds of supplementary, private insurance that people generally purchase. The role of private insurers matters because it drives the government’s bargaining power. If drug companies either sell to the government or they go out of business, then the government can get better prices. The problem there is obvious, though: What does someone do if the government doesn’t cover a treatment they need? But if there are private insurers selling add-on policies to wealthier Americans, then drug companies can deal only with them, and the government’s negotiating power wanes. Another question Sanders’s plan doesn’t answer but is crucially important: How do you guarantee physical access to medical care? Right now, hospitals charge Medicaid one price, Medicare a somewhat higher price, and private insurers an even higher price. If the entire system is squeezed down to Medicare pricing, a lot of hospitals are going to close. How will Sanders keep that from happening? Or will he let it happen, even if it means people in rural areas need to drive hours for care? The easy rejoinder to this is that this is just a campaign proposal, and these are details that can be worked out in the legislative process. I disagree. Sanders is proposing a huge, disruptive reform here — he owes the public answers to the most central, obvious questions about how that reform would work. Perhaps more importantly, he also needs to show that he’s at least aware of the difficulties of a single-payer system, and has realistic ideas for managing the transition. Moreover, the fundamental debate between Sanders and Hillary Clinton — and Sanders and the GOP — is whether single-payer is a good idea at all. That debate can’t be resolved unless these kinds of questions are answered. In the absence of these kinds of specifics, Sanders has offered a puppies-and-rainbows approach to single-payer — he promises his plan will cover everything while costing the average family almost nothing. This is what Republicans fear liberals truly believe: that they can deliver expansive, unlimited benefits to the vast majority of Americans by stacking increasingly implausible, and economically harmful, taxes on the rich. Sanders is proving them right. A few days ago, I criticized Hillary Clinton for not leveling with the American people. She seemed, I wrote, “scared to tell voters what she really thinks for fear they’ll disagree.” Here, Sanders shows he doesn’t trust voters either. Rather than making the trade-offs of a single-payer plan clear, he’s obscured them further. In answering Clinton’s criticisms, he’s raised real concerns about the plausibility of his own ideas.